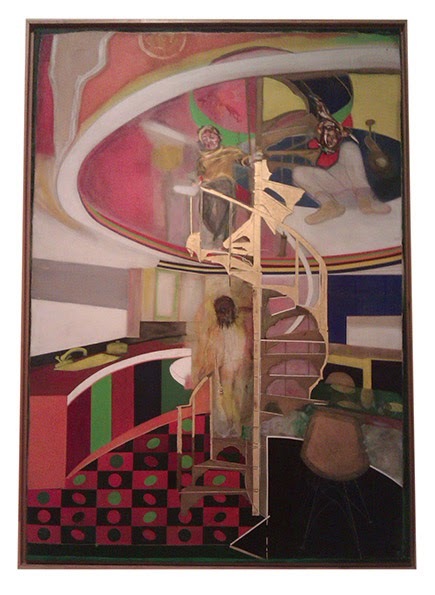 Mirror by Guyana-born British artist Frank Bowling (b. 1936) is on display at Tate Britain, London. The painting is inspired by the staircase that linked the Royal College of Art, a centre of creative experimentation where Bowling was a student, with the V&A Museum, a space representing the art establishment. At the top of the stairs, a figure swings itself in a carefree manner yet shows more self-control a few steps down as though accepting social norms and traditions. Mirror combines figurative art and abstraction.